To try and clarify factors that you need to consider when planning on using an external antenna for your 4G/LTE broadband connection. With 4G (LTE) services starting to come onto the UK market a lot of users are finding that they are achieving download speeds that are lower than they were expecting to get. Often this can be due to poor reception however there are other factors that need to be understood which can affect the broadband speed. Hopefully this short article will help explain the implications and considerations the user needs to examine before they can decide the best course of action. Okay... first things first. What many users do not understand is that LTE is a multi-stream radio, MiMo (multiple in/multiple out) service. btw I'm going to stop using the term 4G; LTE is NOT 4G. The 4G term has been jumped on by various bodies e.g. telco/ISP/Government who don't fully understanding the technology but 4G sounds better to the end users. I'm not going to go into it here but LTE is not 4G; Wiki has several good articles for any readers that want to read about why LTE isn't 4G. Anyway... so LTE is multi-stream MiMo technology. This is like 11n WiFi (which is also MiMo). One of the ways that LTE gets it's performance improvements is to use multiple radio data streams to and from the end client. Just like 11n WiFi, the more streams of data the client can take then the faster the effective broadband. Like 11n WiFi, the terminology which denotes the number of streams is expressed as TxR where T is the number of transmit radio streams and R is the number of receive streams the connection can support. So, if a client supports 2x2 streams then it can generally support twice the upload and download speed of a 1x1 device. In the world of LTE you can have anything from 1x1 right up to 8x8 stream capability with all the possible mixes in between. In simple terms a client device needs to have an antenna for each radio stream. For a 1x1 service then the client just needs a single antenna. For a 2x2 service the client needs two antenna, and so on. So the number of streams a connection can support depends upon the capabilities of the service providers masts and also the radio capabilities of the client device. I first wrote this article back in 2013 and, at that time, the majority of LTE dongles and routers currently being supplied by the providers where lower cost 1x1 devices. However in the intervening 5 or 6 years things have moved on and nearly all dongles, phones and routers now support dual stream capabilities. If you look around you will see various types of LTE (4G) antenna being advertised at range of different prices. One of the differences between these antenna is the number of antenna connections they have. Typically you will see antenna with single connections (so this is for 1x1 client devices) and antenna with dual connections (so this is for 2x2 client devices and also for 2x1 or 1x2 devices). As a general rule a dual antenna cost more than single antenna. Since most routers or mifi devices now support dual stream you want to ensure that the antenna you choose has dual stream, MiMo functionality. So in simple terms that means two antenna connections. However even with a dual antenna setup that doesn't mean the antenna is going to be any good! It comes down to polarization. So the antenna receiver setup needs some physical aspect of the radio streams in order to differentiate them. One way this can be done is by a spatial separation of the antenna i.e. mounting the antenna with a gap between them of a few inches. But this assumes that the polarization of the signal is vertical. What I mean is the radio waves are polarized up and down, this isn't very likely. The radio waves might have left the transmitter mast nicely arranged vertically but after a few reflections then god knows what the orientation of the radio waves will be; they certainly won't still be nice and vertical. So using a couple of antenna setup to receive waves which are only vertically polarized is not the best setup. A better antenna configuration is to orientate the two antenna in a cross pattern. This way each antenna is at 90 degrees to the other so it means you're more likely to pick up a signal over a range of polarizations. So the next thing to consider is whether to go for a directional or an omni directional antenna setup. It doesn't matter if its WiFi or 3G or LTE, most users think just get the highest gain antenna I can find and, invariably, this means a directional antenna. However in the majority of cases a directional antenna is a bad choice and it'll often just make things worse. The problem is radio waves, as a rule, don't go through solid objects. If there's something in the way then the signal gets from mast to you by a process of reflecting and scattering from neighbouring objects. In practice this means that the signal could be arriving at your device from a multitude of different directions. For that reason a high gain directional antenna, which has a very limited angle of coverage, will frequently make things worse. Unless you have perfect line of sight between the mast and where you are going to mount the antenna then a directional antenna should be avoided. Much better to go for an omni antenna; lower gain but at least it should pick up a signal. Though, to be honest, don't get too fixated on the gain of the antenna. The antenna in a typical data dongle is less than zero; a LOT less than zero. So even a low gain external omni with 2 or 3 dBi is still several times higher than the antenna in your dongle. The other issue is antenna location. The fact that the external antenna is placed outside (and hopefully high up) is a significant factor in improving the signal. If we look at the 4G/LTE antenna we sell into the UK market it really comes down to a choice of just two. There's the Poynting A0001 (also called the XPOL-1 or XPOL-A1). This is a lowish gain, 360 degree (omni antenna) with cross polarized configuration. Then there's the Poynting A0002 (also called the XPOL-12or XPOL-A2). This is a cross polarized, medium gain directional antenna. In the UK the omni A0001 is by far the most popular seller... typically over 600 units a month. The advantage of the omni is easy quick installation (no alignment required) and also it's easy for the system to switch transmitter masts and/or where there's very poor non-line-of-sight. On the downside the A0001 omni has lower gain when compared to the equivalent directional. Also an omni can be more susceptible to RF interference coming from different directions. The temptation is to fob-off the omni A0001 on account of the low gain. This is a mistake in my opinion. The advantage of using an outdoor antenna is the antenna is outdoors! Simply getting the antenna the other side of the wall (outside) typically gives a significant signal improvement so even though the A0001 is lowish gain, the fact that it's outside should still give an improvement. The second best seller is the A0002 directional (about 30% sales compared to the omni). Sometimes a directional antenna can give a better signal (stronger/cleaner) but on the downside they need careful alignment which can be particularly tricky where there's no line-of-sight so you're relying on reflection or scattering. Also, if there isn't line-of-sight and the environment changes then you can often find that the characteristics of how the signal has reflected can change (e.g. a wet wall doesn't reflect as well as a dry wall) as such the alignment can change! In addition it's much harder for the system to switch to a different mast which might be dictated by the provider or if you change provider. Where there's a clear line-of-sight to the mast with no ambiguity then a directional is generally the preferred choice. The more frequency space available then the more money Ofcom can make in flogging the licenses to the telcos (again, maybe that's be being a cynical git!). 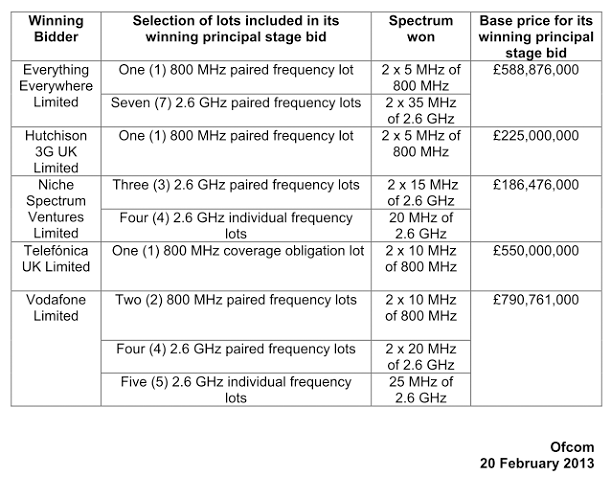 In addition to the above, Everything Everywhere, also have use in the 1800MHz (this was decided before the auction). As you can see the allocations are all over the place. Actually it's even more complicated because some providers have more than one licensed band e.g. Vodafone has frequency allocation in both the 800MHz band and also the 2.6GHz band, and the band used varies across the country and signal mast! Generally, because the lower frequency bands give longer transmission range than the higher frequencies, then the lower bands are used in more rural areas where a mast needs to cover a geographically larger area. Conversely the higher band would be used in more built up areas like towns or cities. However this isn't a definite. I suppose there's no reason why a provider might not decide to use a 2.6GHz service in a rural area – it's not fixed in stone. The implications for the end user are you need to ensure your antenna suits the providers service. So, if you get an antenna suitable for EE on their 800MHz band and then change to a service that uses 2.6GHz then the antenna may or may not be suitable; it just depends if you were sensible in the first place and picked an antenna that can cover 800MHz and also 2.6GHz. All of the LTE antenna from Solwise clearly state the frequency bands they support. In fact we've made a conscious decision to only stock LTE antenna that are suitable to all three UK LTE bands so you don't have to worry about choosing which band antenna for which supplier. Since this article was first written back in 2013 Ofcom and the EU have set aside additional frequency bands to be used for LTE/4G mobile connectivity. So back in 2013 there were only two UK 4G LTE bands and frequencies: 800MHz and 2600MHz (2.6 GHz). Then a section of the 1800MHz (1.8 GHz) was made available. Now there are plans for a 700MHz band and even talk of bands at 3.5GHz! The A0001 and A0002 antenna from Poynting fully support all of the common bands from 698MHz up to 2.7GHz. From the Ofcom table above you can see that spectrum allocated to the providers was split into individual sub bands. However the connected characteristics for the client vary based upon the total number of clients the local signal mast can support and also the bandwidth it can support. This can mean that in areas where there is a high user density then users simply can't get a connection in the first place or the throughput speed is very poor. e.g. we've heard of people that live near football stadiums. When there's a match on then the 4G internet speed is very poor.... almost unusable. Another story, people that live close to the M25 say that if there's a traffic jam on the section of the motorway near them then the internet is totally useless! If your dongle or router only has a single antenna connector then go for an external antenna with single connector. If you have a dual stream dongle or router then you need an antenna with two connectors or use two single connector antenna. Note, however, even if you have a dongle and antenna setup that can support a 2x2 service, if the service coming out from your providers mast doesn't send out 2x2 then you won't see any different than if you were running a 1x1 set-up. As you can see from the Ofcom table previously shown, make sure your antenna setup suits the frequency range of the service coming from your local mast. If you have antenna that only supports 800MHz range but your provider uses a 2.6GHz service then your 800MHz ain't going to work! Unless you don't want to run the risk of having to shin up onto your roof to change the antenna if (when) you change service then it's best to get antenna which cover all three UK LTE bands. So that's 800MHz, 1800MHz and 2600MHz. Our antenna clearly specify their operating frequencies and, as I've said before, we try to only offer LTE antenna that support all three bands; though you do pay a little more for an antenna with this flexibility. My advice is go for an omni. We get a lot of directional antenna back from customers but very few omni types. The reason for this is the customer has just jumped on the antenna which offers the biggest gain for your buck and this invariably means a directional antenna. However most people do NOT have line of sight to the mast so an omni is the way to go. Mount the antenna where it has the best line of sight to the mast. Even if it doesn't have true line of site (in a built up area it can often be impossible to see the signal mast) get it as high as possible and don't position it so it has to go through a thick wall or metal building located 2 feet away! As an example, if, at our office, we try an outdoor antenna at the front of our building (which is one of those horrible metal boxes you see on industrial estates) then we get a rubbish signal even using an omni antenna. However we try the same antenna at the rear of the building and get almost full signal. The reason is the signal mast is at the back of the building (though still not in true line of sight). Using the antenna at the front means the radio signals have to try and blast a hole through the metal building and that's just not possible. Even if you get a perfect signal then, depending upon the capabilities of your provider (e.g. their frequency allocation), the service they can offer from your local mast, how good your dongle or router is, and how many users are connected to the service in your area, it might still give a rubbish download. However, if it's just for doing a Facebook post then you probably won't ever notice! Copyright Steve Mace, Solwise, June 2013, updated September 2018.